What Is This Bite From? 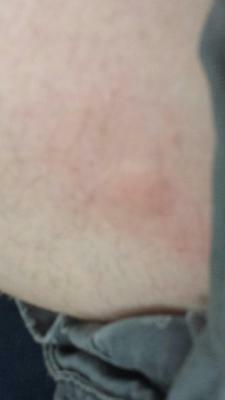 My boyfriend is a truck driver and woke up with 2 welted up bites like this on the back of his thighs up close to his rear end. One on each thigh. Can you help me figure out what it is? My boyfriend is a truck driver and was sleeping in his truck last night like always and woke up with 2 bites on the back of each thigh up near the crease of his back side. He has no clue what it could be, but says it's definitely not a mosquito bite...any help??? He said the welts are still there and the itch and burn and are just uncomfortable...bed bugs? Spider? Flea? Chigger? Any? I have no clue. Please help! It is near impossible to tell what insect is responsible for the bite. Since the bites are limited in number and in one area, we would guess that it is not due to a bed bug, but there is no way to be 100% sure. Chigger bites could be the cause, but these occur outdoors when the person moves through an infested area. To be safe, inspect cracks in the truck seats to see if any insects can be spotted. Run the edge of a credit card through any narrow seams.